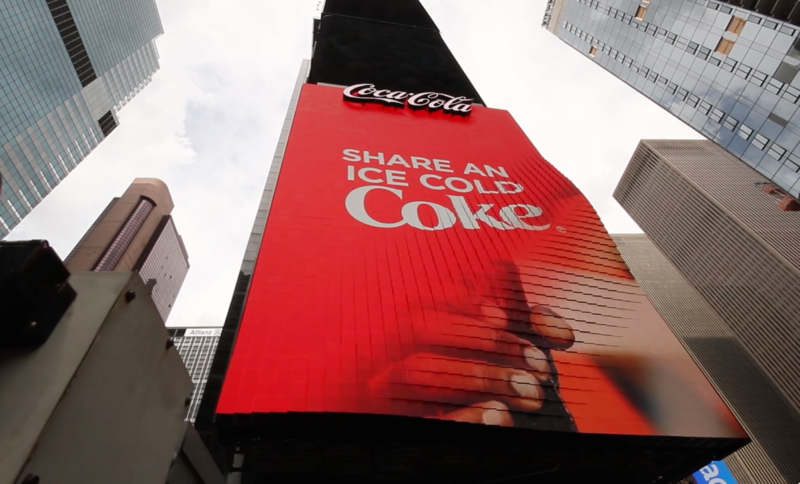 Valencia, CA; August 22, 2017: Cicoil, the leading manufacturer of high performance Flat Cables recently helped Coca-Cola revolutionize its Times Square sign with a New 3-D Robotic Video Display. The Sophisticated 68 ft. high x 42 ft. wide Robotic Billboard is made up of 1760 high-resolution LED cubes, which are in continuous motion, exposed to all kinds of weather and operate 24 hours a day, 7 days a week. Since this is a very high profile location, Coca-Cola required one reliable cable that can perform in just about any operating environment. If one cube doesn’t function, then the entire sign doesn’t function. Fortunately, Cicoil was there to provide a long-term cable solution that just wasn’t a flexible one, but is one that is also a Mission Critical Design Solution as well. For almost 4 years, extensive durability, flex and harsh weather exposure testing was performed on various cables to see which one could consistently survive in these conditions. In addition to the physical requirements, the cables would also have to successfully provide power and signal transmission to each of the large sign’s actuators and display panels as well. Unlike the other cables considered, Cicoil’s flat cable was the only one to survive the rigorous testing. In summary, Cicoil’s lightweight flat cable was chosen not only for its flexibility, but because it provides excellent heat dissipation, tolerates cold (-65C) and hot temperatures (+165C) and withstands extended exposure to vibration, sunlight, wind, acid rain, ice, fungus, humidity and chemicals. If you would like to learn how Cicoil was “The Last Cable Standing” at Times Square (https://www.cicoil.com/blog/company-news), developed the First IDC Ribbon Cable and helped put a Man on the Moon, please contact our office at 661-295-1295 to discuss your application or to set up an on-site visit to your location.